Homemade Chaat Puri is a key ingredient in any chaat and specially in Pani Puri. Homemade Chaat Puri can be used with any other snack like sev puri, dahi puri, etc…However when time comes to make this at home, we always buy Pani Puri Puri from shop because we think Homemade Chaat Puri is very hard to prepare. 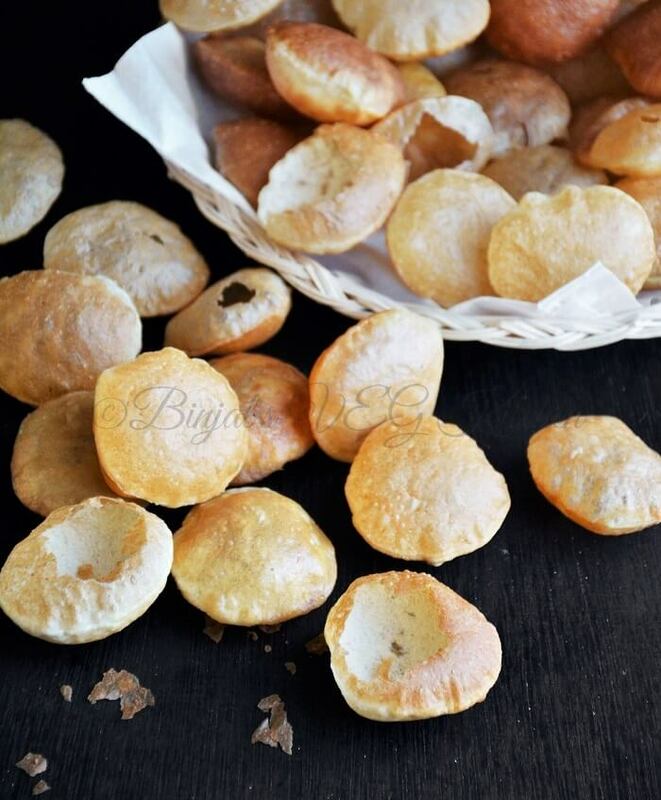 I have tried this at home and I would say making Homemade Chaat Puri is very easy, if you can follow perfect instructions to make Pani Puri Puri. 1. Take all ingredients expect oil in a mixing bowl and mix well. 2. Knead the mixture using cold water and make sticky dough. 3. Knead the dough on kitchen surface about 7-8 minutes and make smooth texture. 4. Now apply little oil on the dough and cover it, keep aside for 30-40 minutes. 5. After 30-40 minutes, take a dough and knead it again for 3-4 minutes. 6. 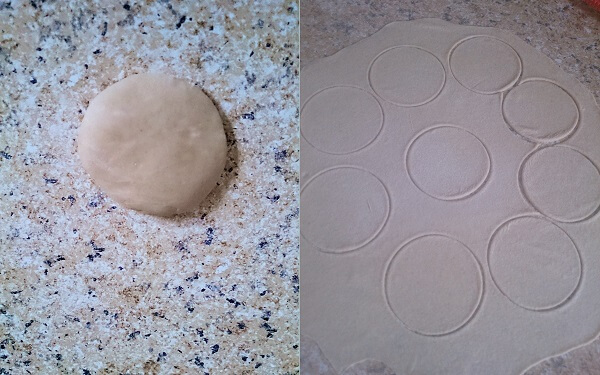 Now divide the dough into two or three parts, take one part on your kitchen surface and roll into very thin chapati. Keep the remaining parts of the dough covered with the moist kitchen towel. 7. With a cookie cutter or a small bowl, cut small to medium discs from the rolled dough chapati. Using a cookie cutter gives even shape and size to the Puri’s. You can also make small balls and roll them. 8. Heat the oil for deep frying in a pan, oil should be medium hot. Add a small piece of the dough ball in the hot oil to check oil temperature. 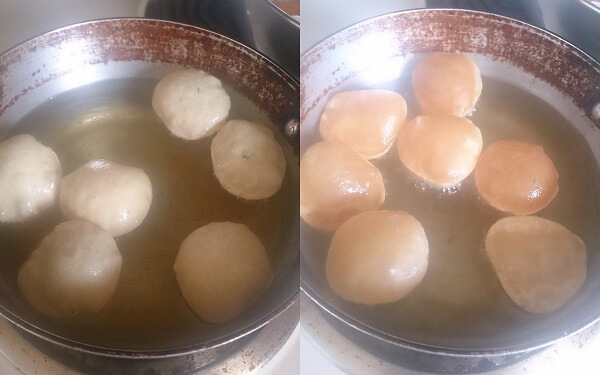 If the ball steadily comes up to the surface, the oil is hot and the Puri’s can be fried now. 9. Now drop the Puri’s in the hot oil, press each Puri using a slotted spoon till puff up in the oil. Once puff turn another side then keep stirring with slotted spoon till golden brown. 10. Remove Puri’s on absorbent paper, it absorbs extra oil from the Puri. Do the same process with remaining parts of the dough. 11. Once cool down, store in an air-tight container. Homemade Chaat Puri is ready. • Always cover the dough in a dump cloth otherwise dough will become dry and will not be rolled properly. • Roll very thin circle otherwise Puri will become soft. • Fry Puri’s on medium hot oil, if the oil is not hot enough then Puri will soak oil and become soggy, if it’s very hot then Puri will burn. • Fry 4-7 Puri’s at a time. While frying keep stirring with slotted spoon, Puri will become crispier. Homemade Chaat Puri is a key ingredient in any chaat and specially in Pani Puri. 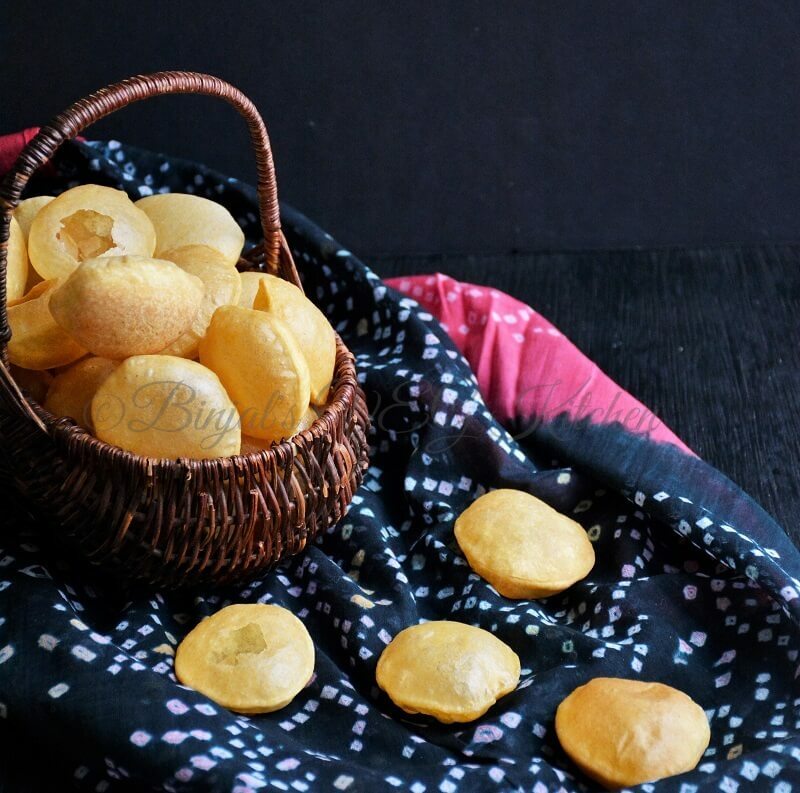 Homemade Chaat Puri can be used with any other snack like sev puri, dahi puri, etc...However when time comes to make this at home, we always buy Pani Puri Puri from shop because we think Homemade Chaat Puri is very hard to prepare. 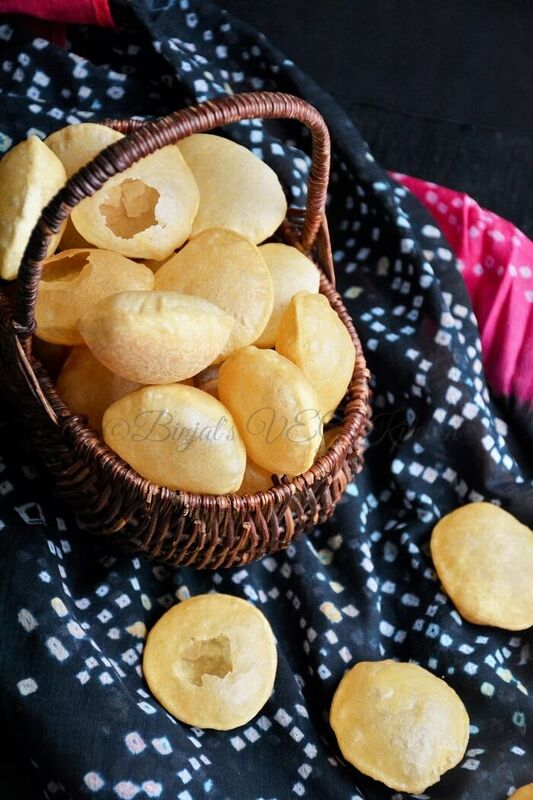 I have tried this at home and I would say making Homemade Chaat Puri is very easy, if you can follow perfect instructions to make Pani Puri Puri. Take all ingredients expect oil in a mixing bowl and mix well. Knead the mixture using cold water and make sticky dough. Knead the dough on kitchen surface about 7-8 minutes and make smooth texture. Now apply little oil on the dough and cover it, keep aside for 30-40 minutes. After 30-40 minutes, take a dough and knead it again for 3-4 minutes. 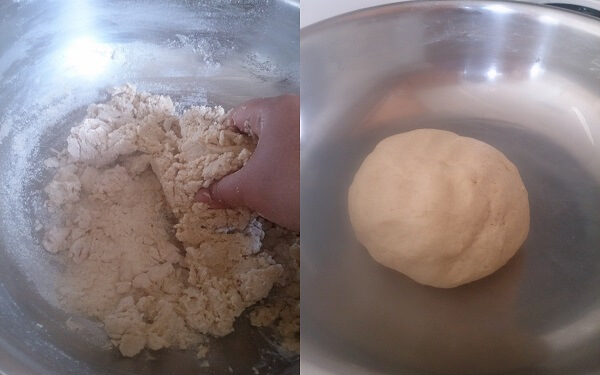 Now divide the dough into two or three parts, take one part on your kitchen surface and roll into very thin chapati. Keep the remaining parts of the dough covered with the moist kitchen towel. With a cookie cutter or a small bowl, cut small to medium discs from the rolled dough chapati. Using a cookie cutter gives even shape and size to the Puri’s. You can also make small balls and roll them. Heat the oil for deep frying in a pan, oil should be medium hot. Add a small piece of the dough ball in the hot oil to check oil temperature. If the ball steadily comes up to the surface, the oil is hot and the Puri’s can be fried now. 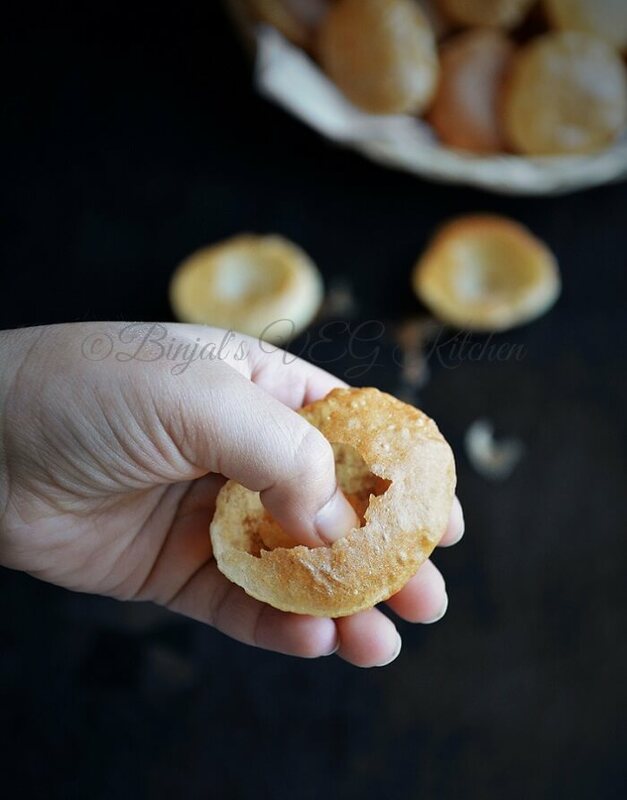 Now drop the Puri’s in the hot oil, press each Puri using a slotted spoon till puff up in the oil. Once puff turn another side then keep stirring with slotted spoon till golden brown. Remove Puri’s on absorbent paper, it absorbs extra oil from the Puri. Do the same process with remaining parts of the dough. Once cool down, store in an air-tight container. Homemade Chaat Puri is ready. Hi.. I tried making these puris.. It’s dint come out well.. Not sure what mistake I made. Only thing is I added oil while kneading.. Will that be a problem? yes Ruchi! 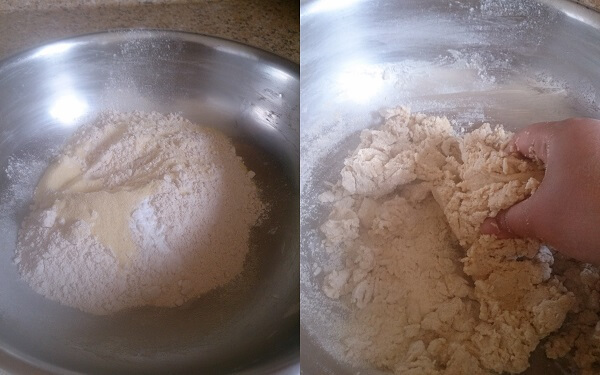 Its a main problem, you have to add oil after kneading the dough, apply it well then knead it again and cover it! Pooja! !baking soda make more crispy n taste like roadside puri n color too!!! Tried these today but the puris did not fluff up. Had to throw the dough away. Maybe it was too hard. Will try again with a softer dough. yes you have to make slightly sticky soft dough and roll using little dusting flour and roll very thin chapati, when you frying press puri with slotted spoon once puff, turn and stir them continuously till crispy brown. A very detailed recipe. Thanks for sharing!! Will make it and give feedback. How many does this make? Super yummy puris..so crispy and perfectly done Binjal..